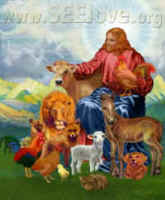 See Ben's site Not One Sparrow which is included on our Compassion in Religion listings. As a boy I was fascinated by anything animal—or "aminal"—as I called them well into kindergarten. I went exploring for whatever insects and feathers I could find. Back inside, I pored over any books I owned or could find on my grandparents' or library shelves about animals. I put together ambitious reports, for school and for myself, on subjects ranging from butterflies and hamsters to dinosaurs and endangered mammals. My family thought I was destined to be a veterinarian, and I thought I would grow up to work in a zoo. Though my parents were reluctant to bring larger pets into the house, they did encourage me to keep any number of smaller animals: goldfish and parakeets, lizards and turtles, rabbits and my favorite, hamsters. I was captivated by these furry little creatures with mild personalities but such serious habits: running in wheels and see-through hamster balls; lushly padding their nests, no matter how many times I cleaned the little house in their cage; and packing their cheeks with food to laughable proportions, only to drop it off in their favorite "pantry" spot. I was deeply affected by the suffering of these and other little creatures. My mother describes one instance when, as a 5 year old, I happened to break the wing of a butterfly while playing with some friends. When she told me the butterfly wouldn't be able to fly any longer, my eyes brimmed with tears and I set to putting together a book of "things we should be fragile with." I was beyond distraught when my first pet, a goldfish named Jack, died. But as I grew a little older and more distracted by other interests, I became less affected by the animals in my care. By my mid-teens I didn't even bother with pets, which was at least the responsible decision to make. I hardly kept any contact with animals at all, and carried this shortcoming with me into adulthood, falling in line with the general obliviousness much of society has toward animals. Seven years ago, alone and terribly lonely in my first apartment out of college, a providentially-placed neighbor introduced me to a stray kitten who she had nursed to health but couldn't keep. I instantly fell in love with this little ball of life and had no choice but to take her in, despite the fact that I had never imagined myself as a "cat person." "Baby," with her beautiful Halloween-spotted coat and snow-white bib and paws, would wait to use the bathroom with me in the morning, and lounge on the window sill until I came home at night. Everything about her enthralled me, from her deep golden eyes that could melt your heart one moment or stare daggers the next, to the way she followed me around the apartment but only allowed me to touch or play with her on her terms. Between "Baby" and the three others that followed (adopted between me and my wife), I developed an extraordinary appreciation for the precious existence of each of these creatures under my roof. And by God's grace just the same, I was gradually beginning to reopen my eyes to my outdoor surroundings, and the wide assortment of fauna which inhabit them. During long walks along the Des Plaines River trail, tucked behind a Chicago suburb strip, I became aware of the animals all around. I paused to watch the geese with their young families on the water along with butterflies, frogs and turtles that wandered across the path. I kept a wary eye on the territorial red-winged blackbird who followed me noisily from tree to tree. I paid more attention to the gaggles of ducks, and scurrying rabbits and squirrels which watched me even more intently. I realized that the same unique reason for being and will to live which I found in my own cats must be present in all other animals. It belongs to every creature because God made it so, creating each with a painstaking and personal touch. And as his children, we can't hope to honor him, or his creatures, unless we respond to them with the individual recognition and nurturing their existence warrants. Appreciation for God's creatures led me naturally to the animal welfare cause, and has deepened as I examined the Christian doctrines of creation, stewardship and redemption. But I am also aware of humanity's fall from grace and the atrocities of neglect and cruelty committed against animals on isolated and institutionalized scales. We can't randomly assign individuality and dignity to some animals, but withhold it from literally millions of others when it's convenient for us to do so. In Scripture, God grants humanity certain permissions to benefit from animals, but he must be deeply saddened and angered by the ways we have twisted those permissions into indefensible abuses of his creatures. I believe that God has even more life-affirming intentions for his creation, which we can work toward as followers of a gospel which is good news for all. One year ago I realized God didn't just want me to care about animals and their suffering; he wanted me to do more. One capstone project for grad school and more than a few gut-checks later, not one sparrow hatched. 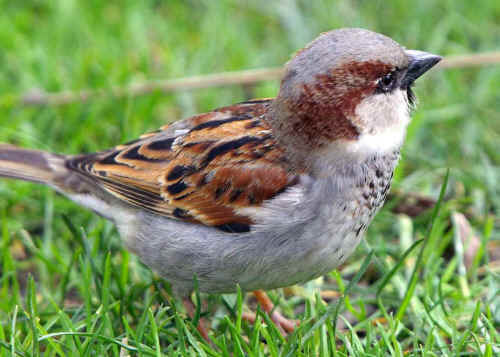 I can only hope it grows to bear out its name: "Aren't five sparrows sold for a couple of pennies? But not one of them is forgotten by God" (Luke 12:6).